Canon 500mm f/4L IS lens with 1.4X II TC and EOS-1Ds Mark II. ISO 800. Evaluative Metering +1/3 stop: 1/640 sec. at f/5.6. We were delighted when a momma bear with two yearling cubs approached us. This little guy stood up, looked at us—probably out of curiosity, and began to dance. 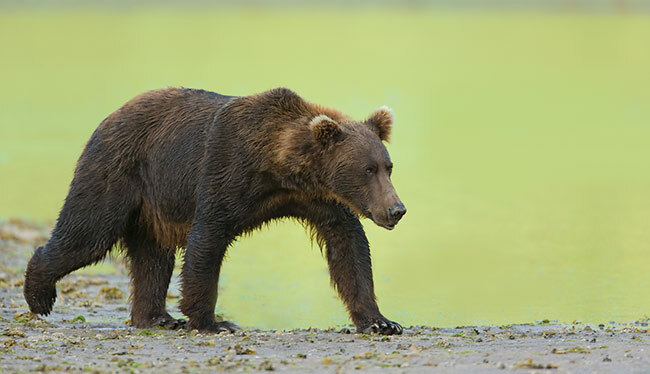 As I called out to alert the group I switched from horizontal to vertical format as fast as I could but it was too late, the young bear got down on all fours. I did, however, choose to stay with the subject realizing the many animals repeat previous behaviors. He did, and I created four images; this is my favorite. 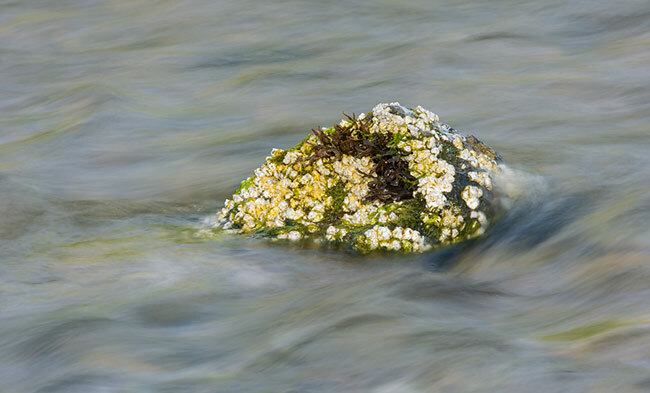 Six lucky photographers joined me in Anchorage, AK on July 31 and on the early morning of August 1 we flew to Kodiak, packed our gear and luggage into two vans, and met the skiff at Anton Larsen Bay at 8am. We cruised by eagles and puffins and guillemots and otters for 30 minutes on our way to the Coastal Explorer, Chuck Keim’s 62 foot vessel that would be our home for the next six days. After we got our stuff into our cabins we made a short run and immediately began photographing a huge kittiwake breeding colony from the big boat. After about an hour, we made another short run to Chuck’s amazing otter kelp bed where there were more than 500 tame sea otters enjoying life in the kelp-lane. Some of the group opted to photograph from the big boat while others worked from the 25 foot skiff. It would be hard to imagine a better photographic opportunity for this usually difficult-to-photograph animal. That afternoon we trolled a bit for salmon and caught two halibut instead. Though I wanted to stay with the otters for another day the group was anxious to get to the bears so we headed across the Shelikof Strait that evening and anchored up at about 11pm after a great dinner prepared by Erik, a wonderful young man from Louisiana who has been Chuck’s mate and cook for the past three years. Though I had told the group how skilled Erik was in the kitchen they were amazed at every meal. Canon 500mm f/4L IS lens with 1.4X II TC and EOS-1Ds Mark II. ISO 500. Evaluative Metering +1/3 stop: 1/400 sec. at f/8 in Manual Mode. This image was made while lying down on the lowered front gate of the skiff and photographing right out the front of the boat. 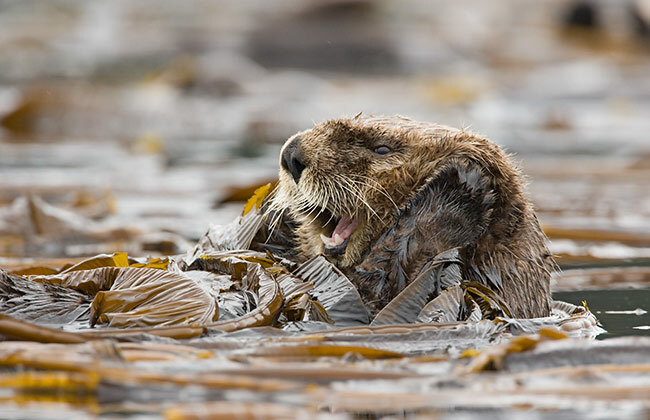 It seemed that the otters were so comfortable in the kelp that they allowed us to approach closely. Some were so curious about the strange beings in a small boat that they came up out of the water to get a better look at us. Chuck and Erik told us that for the two weeks before our arrival it had been cold with almost constant pouring rain and high winds, often of 35 mph or higher… On our first two days, the weather was perfect for photography: cloudy bright. 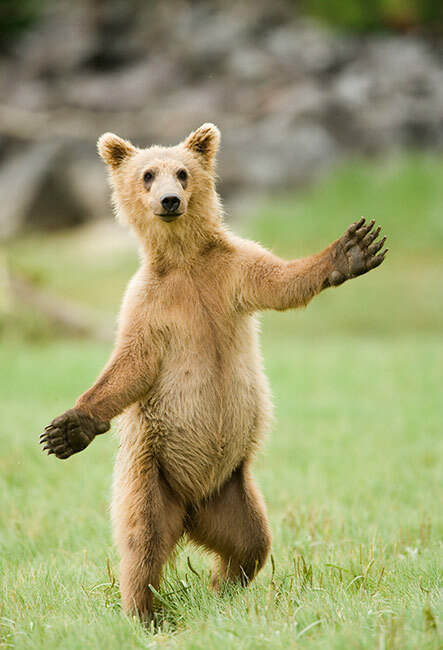 We did all of our bear photography in the famed Geographic Harbor. 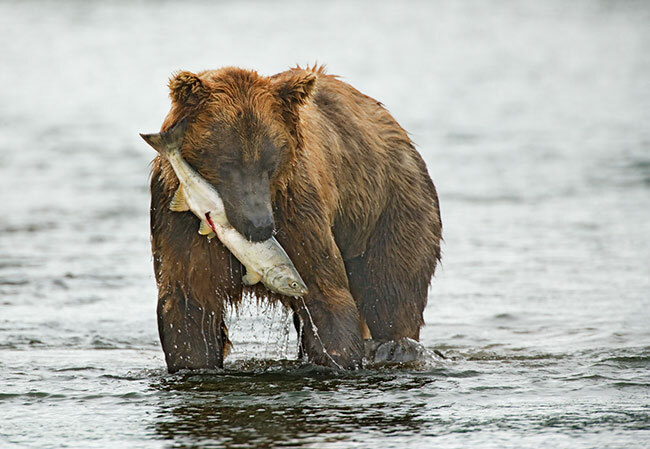 We had lots of good opportunities with about ten bears on our first day, but the chum salmon run was late, most likely due to the poor weather. On our way to the river in the skiff we saw a mother bear with two jet-black football-sized spring cubs. She meandered by in the high grasses near the river, pausing occasionally to stand up and check us out; we were disappointed that we did not get a chance at those cute little ones. The group was thrilled to be so close to such powerful animals but everyone felt comfortable with their presence almost immediately. On August 3, our third day, it rained all day, but the predicted high winds did not materialize. We did several slide programs, shared images, and did lots of Photoshop instruction and sharing. Speaking of sharing, it was a wonderful group. Duncan and Judy Douglas, just back from a trip to Australia, were BAA first-timers. Duncan consistently went out of his way to help others in the group, while Judy was happy with her point-and-shoot digital camera and her binoculars. IPT veteran Tom Schwab (who made the Silver Salmon Creek trip last September) and retired Air Force chief judge Jim Heupel (who made it to the Dallas Seminar last year) rounded out the North American contingent. We were joined by Michael Viljoen (FIL-yon) from South Africa (who was a sweetie and a new convert to digital) and IPT veteran Alejandro Furman from Chile. Alex, who was using film on this trip for the last time, was none-the-less a Photoshop wizard who was willing and eager to share his incredible tips with the group at all times. I will be adding the great stuff that I learned from Alex to the Digital Basics update in September after my hernia surgery. On Days 4 & 5 there were lots more salmon in the river. A single bear, our pal “Scar,” did most of the catching. Scar looked as if the world’s largest bear had bitten him on the head… Many of the bears were distinctive so we nicknamed them. Two of our other favorites were “Foxie” and “Lassie.”” When we mentioned our nicknames to a float plane guide he said that he did not like nicknaming the bears because they might become confused if different groups gave the same bear a different nickname... <smile> In general the morning incoming tides were more productive than the afternoon low tides, but on the afternoon of Day 4 a mother bear accompanied by two blonde yearling cubs approached us, albeit cautiously. Canon 500mm f/4L IS lens with 2X II TC and EOS-1Ds Mark II. ISO 800. Evaluative Metering -1/3 stop: 1/250 sec. at f/11. This is “Foxie,” one of our favorites. 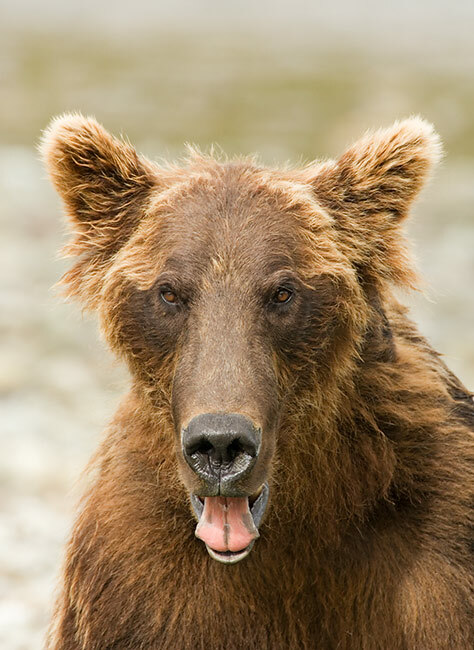 It is rare that the Brown Bears will look directly at you. The morning of Day 5 was our first clear sunrise. We delighted in photographing the bears with green-water backgrounds (the alder-covered hillsides to the west were reflected in the waters of the bay and the river). 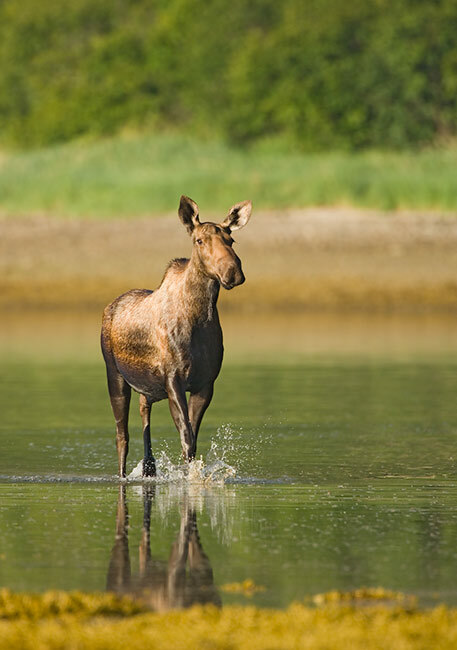 We were all amazed when an adult female Moose crossed a shallow bay and walked right by us as if we were not even there. Day 6 dawned cloudy bright. Michael Viljoen spotted an adult bear clamming on a distant flat and suggested that we try to land and photograph the bear and we did just that. 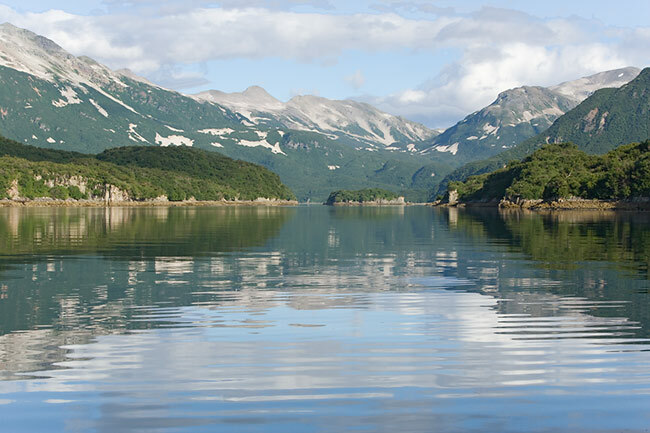 Rather than continue on to the river, we rode around Geographic Harbor in the skiff in search of more bears (and did the same on our last morning). 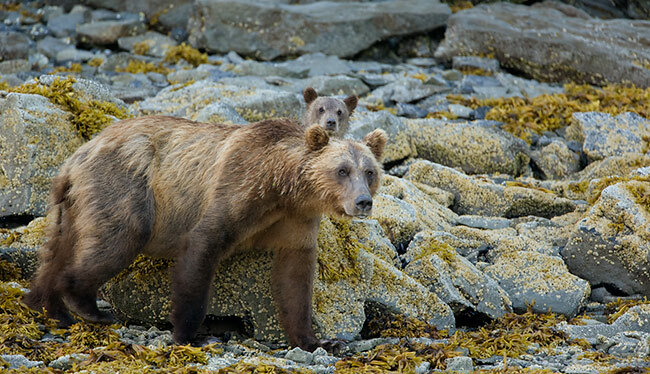 We were rewarded with chances on a pair of spring cubs and another pair of yearling cubs plus some great opportunities to photograph the bears on kelp & mussel-covered beaches and rocks. 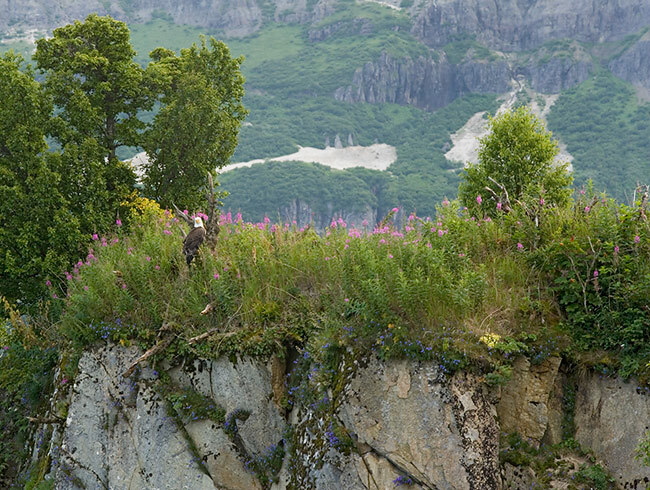 Day six turned magical as we photographed an adult Bald Eagle perched on a wildflower-covered ridge and then landed on the beach below where a wealth of “It Ain’t Just Birds” subjects awaited us. These included alder leaves, sand patterns, barnacles, and wildflowers. On the afternoon of Day 6 we ventured out into Shelikof Strait to photograph Steller’s Sea Lions at their traditional haul-out and had two great hours of halibut fishing that included two 35-pounders and lots of 20-pounders. 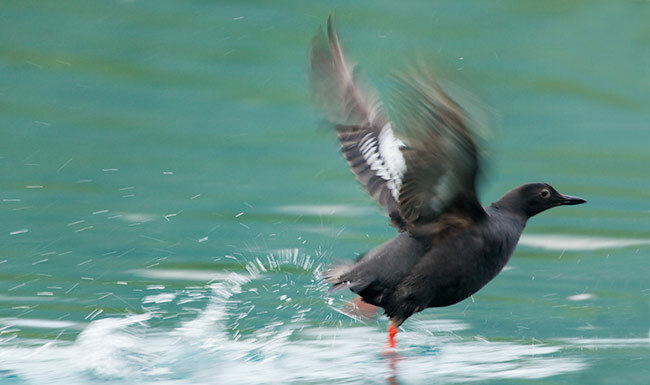 On the way back to our last anchorage we saw and photographed large groups of post-breeding Surf and White-winged Scoters. After our morning skiff ride on Day 7--the very last bears that we saw were the two tiny black cubs and their Mom but again they were too shy to be photographed--we packed up and took two float planes back to Kodiak and then caught our flights to Anchorage and points beyond. Michael was continuing on to a fishing and bear-viewing lodge somewhere in Alaska and Alex was headed for some great landscape photography in the Palouse area in Washington State. All in all it was a great trip. Evaluative Metering at zero: 1/320 sec. at f/5.6. Photographing from the skiff with seven of us was a challenge but with such a great group everyone went out of their way to ensure that the other guy had a good chance. You may remember me -- we met in Nome, AK in June, 2003 at the Aurora Inn and in the field. At that time I didn't have much interest in photography, I was into digi-scoping. Since then I've become a Canon user and have purchased various lenses and cameras. As a bird guide, birding has to be my primary function and all my photography has to be done hand held. I started with a 10D then 20D and my current primary equipment is 1D Mark II and 400mm DO lens. I normally use this with a 1.4X extender. While in the field recently, the 1.4X tele-extender released itself from the lens. The lens was safe (attached to a strap around my neck) but the 1D II still attached to the extender fell to the ground. The tele-extender took the brunt of the fall and was totaled and the camera sustained viewfinder/diopter damage. The camera was under warranty but Canon did not honor the warranty stating that it does not cover impact damage. It did not seem to matter to them that it was the failure of the Canon tele-extender that caused the damage. They simply did not believe my story. Have you ever had a tele-extender release without operating the release lever? To make a long story short, I have never experienced or even heard of a Canon TC "releasing" under load. What happens every so often with both teleconverters and extension tubes and even with camera body mounts is that the locking pin sticks when you mount the camera or the accessory; the locking pin fails to snap into place... When and if that happens, the camera can easily become detached from the lens. If you notice that happening, it is best to stop using the item immediately. (It is the photographer’s responsibility to always listen for the click...) If you continue to use the item and forget to jiggle the little lever to make sure that the pin extends, your equipment will be at risk.. On short trips I travel with two 2X TCs and three 1.4X TCs. Why? These accessories play a vital role in what I do and if I drop one in the water or have a locking pin stick, I need a replacement right then and there. On longer trips I often take three 2X TCs and four 1.4X TCs. Evaluative Metering: 1/500 sec. at f/8. Over the past year I have come to realize that one of the things that separates intermediate photographers from advanced photographers is that the really skilled folks do not hesitate to use their 2X teleconverters with their big IS lenses while the less experienced folks shy away from that combination. And the advanced photographer is always confident that they can consistently produce sharp images at shutter speeds down to 1/60 sec. The best way to learn to make sharp images with a 2X TC and a big f/4 super-telephoto lens is to use that combination often; practice makes perfect. In ABP II (http://www.birdsasart.com/ABPII.htm) I share my advanced sharpness techniques with a series of excellent images created by Jim Litzenberg. We have several V-2 Wimberley Heads and Blubbs in stock. Delkin e-film Pro (compact flash) Cards are no longer back ordered. And as always, we have lots of Lens Pen Combo Kits and those sturdy R-O Flash Cords on the shelves. I purchased a Lens Pen from you back in March this year - used it immediately and was very impressed with the result. The whole procedure was rather unnerving, however, and so I have been putting up with a dirty sensor for a while, which was mostly the result of a trip to The Gambia and frequent lens changing. Today I have leapt off a cliff for the second time and survived! Now the sensor on my D70 is again wonderfully clean and my nerves are far less jangled than the first time around. It gets easier with practice, I think! So - thank you again - you have saved me a sixty mile round trip to London AND all the costs incurred in getting there and having the sensor cleaned professionally, not to mention using only twenty minutes instead of a whole day. Hope your day is as good as mine already is! Important note: Folks who own cameras with vibration reduction sensors (like the Minolta 1d) are advised not to use a Lens Pen to clean their sensors. Evaluative Metering +1/3 stop: 1/200 sec. at f/5.6. The moment that we saw the reflection of the hillside in the bay we moved into position to use the green water as the perfect backdrop. My name is Pierre Nadeau from Quebec Canada. Last week I ordered a neoprene lens cover from Jim for my brand new Canon 500 f/4L IS lens. The quality is excellent, as was the service; I am very pleased with your product! I will recommend BAA to all of my friends. All in all I find your Digital Basics publication an excellent resource to help me in post-processing my bird photos. It is precisely what I have been looking for and is a great help because it is specific to this particular application. I have read tons of reference and training publications on Photoshop but they are, of necessity, very general in nature. This requires that one has to wade through a lot of material in hopes of finding just what is needed to solve a problem. If you will be visiting Bosque this fall now is the perfect time to get yourself a copy of this comprehensive Site Guide: http://www.birdsasart.com/siteguides.htm#BOSQUE%20SITE%20GUIDE%20NOW%20AVAILABLE! Evaluative Metering +1/3 stop: 1/125 sec. at f/8. I received an e-mail a while back stating that both of the crane pools on the west side of Highway 1 would be drained before the season begins this year and that they will be without water (and thus without birds) from fall through winter. If anyone has information on this issue I would appreciate hearing from them by e-mail. If it is true, it will simply present new challenges and open up new opportunities. I will be arriving in New Mexico on November 12th this year and will forward a short report that will be sent to the Bulletin distribution list. A detailed Bosque Site Guide update will be sent to folks who have purchased the Site Guide no later than 20 NOV.
Evaluative Metering +1/3 stop: 1/250 sec. at f/8. When working from the skiff in low light choosing a high ISO was often the proper move. Lots of out of town folks from California, Colorado, Texas, Maryland, Toronto, and even two from Norway have already signed up for the weekend. The Albuquerque “The Art of Nature Photography; It Ain’t Just Birds” Weekend Seminar will take place at the Carlisle Hotel, 2500 Carlisle Boulevard NE in Albuquerque on December 2-3, 2006. Saturday will be devoted to learning the techniques needed to create pleasingly designed, technically perfect images of natural history subjects. Saturday topics will include getting the right exposure, advanced composition and image design, making sharp images, creating effective motion and zoom blurs, using flash as fill and as main light, and tips for getting close to free and wild birds and animals. Sunday will be devoted entirely to Digital Photography and Photoshop with much of the time being spent on live Photoshop demonstrations. On our IPTs I see many great photographs that are ruined because folks have no clue as to how to effectively optimize their images. Join us to learn how to make your images look great in minutes. We are now accepting registrations. Paypal is best but we will be glad to take your credit card information by phone (863-692-0906) or to cash your check. If sending a check, please make it out to “Arthur Morris” and send it to us at BIRDS AS ART, PO Box 7145, Indian Lake Estates, FL 33855. Be sure to include your snail mail and e-mail addresses and your day, evening, and cell phone numbers. The cost of the weekend seminar is $159. The cost of either single day is $99. Register with a friend or spouse and take $10 off each registration. Here is our Cancellation Policy: If for any reason you need to withdraw, please notify us ASAP. Once we receive your e-mail, phone call, or written notice of your cancellation the following fees apply: cancel before September 2, 2006 and your fee will be refunded less a $20.00 cancellation fee; cancel by November 2, 2006 and your fee will be refunded less a $50.00 cancellation fee; cancel after November 2, 2006 and there will be no refund. Evaluative Metering +2/3 stop: 1/20 sec. at f/16. Here I used mirror-lock and the 2-second timer to ensure a sharp image. Remember, it ain’t just birds! 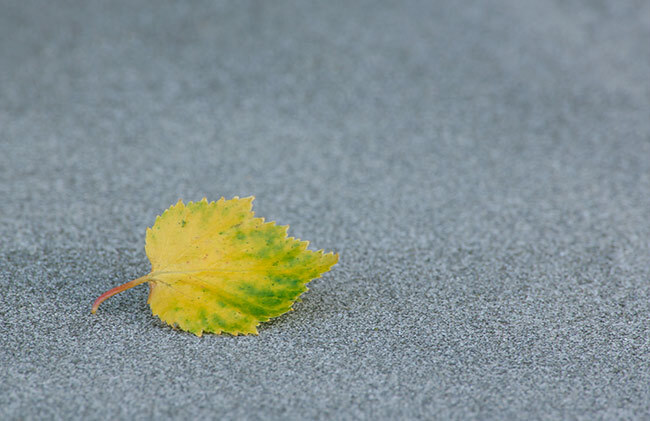 (I “posed” the leaf by propping it up on a curled-up leaf.) Images like this have great potential for stock sales because there is lots of room for text, and, more importantly, because of the calm, peaceful, serene mood. My main motivation for creating it, however, was to make something beautiful. On Thanksgiving Day, 2006, I will again be hosting a photographer's lunch for those lucky enough to be visiting Bosque Del Apache during the holiday season. With the unfortunate demise and closing of Socorro's ValVerde Steakhouse, we were hard-pressed to come up with a good place to eat last year. At the last moment, someone suggested that we try the Luna Mansion (http://www.ghostinmysuitcase.com/places/luna/index.htm) about 40 miles up I-25 in Los Lunas, New Mexico. Wow! We had great food--fine dining in fact--in a glorious setting. This elegant restaurant occupies a historic landmark building that was constructed in 1881. I have made arrangements this year for lunch for up to 50 folks at 11:30am sharp. The cost of the complete lunch including main course, dessert, beverage, and tip is $30/person. (Wine not included.) We are now accepting reservations by check only. You must make a reservation in advance as we will need to finalize the group size a month prior to the holiday. If you would like to join us, please mail a check made out to "Arthur Morris" for $30/per person to PO Box 7245, Indian Lake Estates, FL 33855. You must include your e-mail address and a note stating, "Thanksgiving Lunch." Evaluative Metering +1/3 stop: 1/400 sec. at f/8. This animal kept coming and coming; we wound up making head portraits, but I like this one with the splashing water and the kelp. Canon 500mm f/4L IS lens with EOS-1Ds Mark II. ISO 50. Evaluative Metering: 1/6 sec. at f/32. I chose the lowest ISO in order to achieve the greatest amount of blur. Mirror-lock and the 2-second timer ensured that the rock would be sharp while the low shutter speed painted the watery reflections onto the image. Bosque #1: "The Fall Color IPT" NOV 14-16, 2006. 3-DAY: $929. Slide Program on the evening of NOV 13. (SOLD OUT) This IPT should feature a better chance for a day or two of the rare south winds that drastically improve flight photography and will definitely feature the brightest fall-color cottonwoods. Bosque #2: "The Pre-Thanksgiving IPT" NOV 19-21, 2006. Slide Program on the evening of NOV 18. 3-DAY: $929. (SOLD OUT) This and the next IPT have sold out for the past eight years. In 2006 I may once again be hosting a Thanksgiving Day luncheon buffet. If it goes, folks will need to reserve a spot and pay in advance. Details TBA. Dinner will be strictly limited to 50 folks. This IPT will feature increasing numbers of geese and cranes with lots of great opportunities. Bosque #3: "The Post-Thanksgiving IPT" NOV 25-27, 2006. 3-DAY: $929. Slide Program on the evening of NOV 24. (SOLD OUT) This IPT has sold out for the past eight years as it is scheduled on dates that I consider peak for Bosque. Bosque #4: "The Full Moon IPT" DEC 4 (mid-day) through DEC 7 (mid day), 2006. 3-DAY: $929. (SOLD OUT) Slide Program mid-day on DEC 4. Co-leaders include Manuel Presti, 2005 Wildlife Photographer of the Year, and Robert Amoruso. This IPT includes a half day of photography on the 4th, two full days of photography on the 5th and 6th, and a final half day on December 7th. Limit 14. This IPT has been scheduled to maximize the opportunities to include the rising and setting full (DEC 5) and near-full moon in your images. There will be lots of the usual chances as well, and this time period has provided more than its share of spectacular sunrises and sunsets over the years. SW FLA Post X-mas IPT: DEC 27-29, 2006. Slide program on the evening of Tuesday, DEC 26. 3 -DAY: $1029. (Limit 14 Openings: 12.) Co-leaders: Robert O’Toole, Alfred Forns, & Robert Amoruso. Sanibel Island, Little Estero Lagoon, Venice Rookery, Cape Coral. Herons, egrets, gulls, terns, skimmers, shorebirds, both pelicans, Osprey, Burrowing Owl, and lots more. San Diego IPT: FEB 3-6, 2007. 4-FULL DAYS: $1359. Introductory slide program on the evening of Thursday, FEB 2. (Limit 12.) LaJolla, Shores Beach, Coronado, and Santee Lakes. Brown Pelicans, Heerman’s & Western Gulls, Marbled Godwits & lots more shorebirds, Wood & Ring-necked Ducks & Lesser Scaup. And lots more. SW FLA President's Holiday IPT: FEB 17-21, 2007. Slide program on the evening Friday, FEB 16, 2007. 5-DAY: $1649. (Limit 14.) Co-leaders: Robert O’Toole, Alfred Forns, & Robert Amoruso. Sanibel Island, Little Estero Lagoon, Venice Rookery, Cape Coral. Herons, egrets, gulls, terns, skimmers, shorebirds, both pelicans, Osprey, Burrowing Owl, and lots more. Fort DeSoto IPT: APR 13-15, 2007. Slide program on the evening of Thursday, APR 12. 3-DAY: $999 (Limit 14; openings: (9.) Co-leaders: Robert O’Toole, Alfred Forns, Robert Amoruso, and Todd Gustafson. Courtship and breeding behaviors of Laughing Gull and Royal and Sandwich Tern. Herons, egrets (including both dark and light phase Reddish Egret), shorebirds (including Long-billed Curlew), gulls, terns, and skimmers among others. Canon 70-200mm f/2.8L IS lens (handheld at 73mm) with EOS-1Ds Mark II. ISO 250. Evaluative Metering: 1/200 sec. at f/16.